3. Add half cup water to jaggery and bring to boil. Filter jaggery in a muslin cloth. This step is necessary esp if your jaggery has lot of dust. 4. Bring this filtered solution to boil again till you get a loose 1 string syrup (a drop of syrup pulled btw your thumb and index finger gives you a firm 1 string). If you understand kannada, go ahead with next step when you get gejjepaaka. Switch off the stove and mix in the wheat coconut mixture. 5. Make small balls out of the mixture and flatten them between two palms. 6. Dip this flattened Gulpavate in dry coconut and keep it aside. 7. A day old gulapavate tastes yummy than the fresh one. Enjoy!! this healthy sweet. 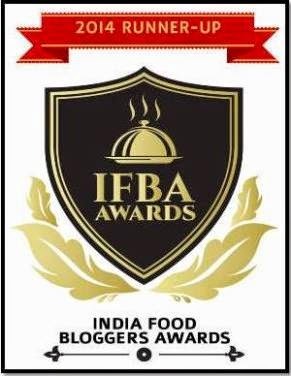 Vanishri Bhat of Veggie Flavors and Indrani of Recipe Junction has showered me with 'One Lovely Blog' and 'Sunshine Award' to me. Thanks girls for thinking of my blog for being lovely and spreading little sunshine :D.
Interesting sweet,new to me,sounds healthy. My ajji used to make this sweet when we came back from school. So you brought back a lot of child hood memories. Thanks!!! Such a beautiful looking sweet, wish i could have some..
lovely and tempting sweet dish. Looks delicious. Must be filling too, besides being healthy . Seasons greetings to you and family. I have never heard of making this with whole wheat. My mom always made it with wheat flour and that is how I make it too. I have seen people make this with rave/soji too. Nice ones. I never tasted this one- very tempting ur dish! Mouth Watering L..Yummmy Yummmy..... Any new mouth watering recipes for 2011. Channagi kaaNasthaide, LG! Naave sanna rave allu guLpavate maadhtivi. Very nice sweet.Healthy and nutritious. I have tasted a similar sweet prepared out of roasted wheat flour and sugar,at a Sathyanarayana pooje. Seasons greetings and a very happy New Year to you and your family. Sounds interesting, should we dry the wheat before making into a powder?